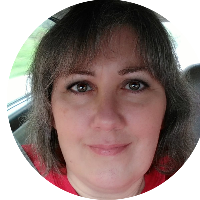 I am an Independent Sales Consultant with Norwex, and I absolutely love my job! But, I am not a salesperson! I became a Norwex consultant after only using the products for 2 weeks. I absolutely fell in love with them because of how healthy, super simple, quick, and amazingly clean they make my home. I first learned about Norwex 7 months ago at a friends party, and it was a game changer! I was immediately taken by the idea that I could clean my house with just water, I could save money and time doing it, I could reduce chemicals in my home, and I could change lives. 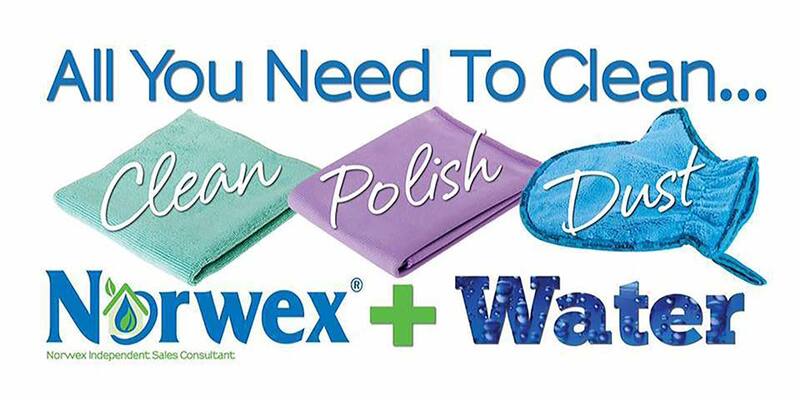 Simply put, Norwex products provide a healthy and less expensive way to keep your home clean. The goal is to create “safe havens” in our homes by radically reducing the number of chemicals we use in them. The way to do this is to offer a new way to clean – chemical free. The solution is to clean using only water, and Norwex microfiber. No chemicals required! Products such as the EnviroCloth have the ability to remove up to 99% of bacteria from a surface, using only water. How Do Norwex Products Actually Work? One of the greatest things about this special microfiber is that it can remove up to 99% of bacteria from a surface using only water. That’s incredible – and a much better clean than other cleaning products. Not to mention cheaper. But how does the microfiber actually work? The microfiber is made from tiny fibers woven tightly together. 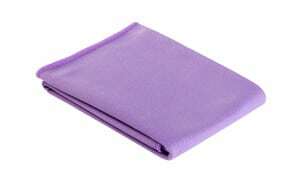 This allows the microfiber to pick up very small particles by “lifting” them from a surface that is being cleaned. It then “traps” the particles in the microscopic spaces between the fibers. How the microfiber is made is truly incredible. These fibers are 1/200th the size of a human hair. When one of these microfiber product is made, the fibers are woven so densely that just one could reach from Canada all the way to the Gulf of Mexico. 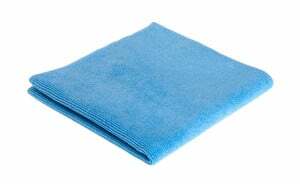 Because of this, these microfiber cloths can hold up to 7 times their weight when cleaning up liquid and grime. Some of the Norwex products have what’s called BacLock. 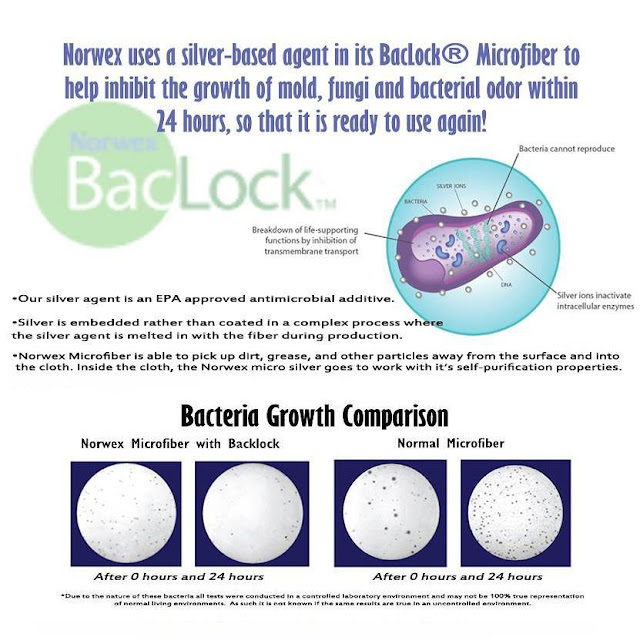 Norwex BacLock is an antibacterial agent which is for self cleaning purposes only. This antibacterial agent is designed to inhibit bacterial odor, mold, and mildew growth in the microfiber products. What Surfaces Can Norwex Microfiber Be Used On? This is the great part – are you ready? Norwex microfiber can be used on any household surface! You can use it to remove grease, dust, grime, or anything else with ease. Another great part about cleaning with these products is that the upkeep of these products couldn’t be easier. Just rinse out the microfiber, and hang to dry. That’s it! From time to time you'll want to launder these products, and I’ll be writing more about that soon. Did you know that the average household spends over $600+ every year just on cleaning products? By switching to Norwex, you don’t have to throw money down the drain any longer. There’s no need to keep sending money on cleaning chemicals that aren’t good for you or your family. Plus, cleaning chemicals sometimes make more work, because you have to go back and re-clean the residue that’s left behind. What’s The Best Way To Get Started With Norwex? Norwex has a lot of great products, but if you’re just getting started, the Household Package is a great place to start. This is the cloth that started it all! The antibacterial microfiber EnviroCloth removes dust, dirt, and grease from all washable surfaces using only water—no chemicals! The microfiber has the ability to remove up to 99% of bacteria from a surface when following the proper care and use instructions. 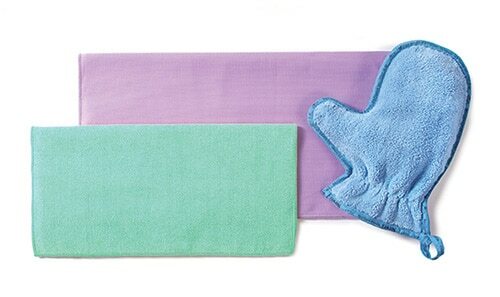 The super-absorbent EnviroCloth picks up dust particles and traps them in the cloth until you rinse it out. Then BacLock in the cloth goes to work to self-purify and inhibit odors from bacteria, mold and mildew growth within the cloth. This is one of everyone’s favorites! Now you too can have streak free windows! The hard-working Window Cloth gets windows, mirrors, shower doors, glass tables, crystal, granite counter tops, jewelry, brushed and stainless steel, chrome, knickknacks, patio tables, and shiny surfaces sparkling clean with only water. And with BacLock in the cloth (the micro silver antibacterial agent) goes to work to self-purify and inhibit bacterial odors, mold and mildew growth within the cloth. Dusting has never been easier! 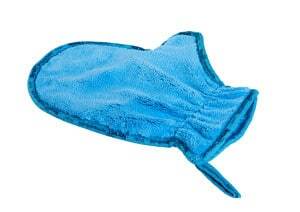 The Dusting Mitt can be used wet or dry and is ideal for quick, chemical-free dusting throughout the house. It's great for use on blinds, screens and other hard-to-clean areas. With its thick texture; dense, plush fibers and unique mitt design, the Dusting Mitt attracts and holds dust and allergens and won’t let them go. The BacLock in the mitt (the micro silver antibacterial agent) goes to work to self-purify and inhibit bacterial odors, mold and mildew growth within the mitt. Great news! You don’t have to go to a Norwex party to order the household package. You can order online direct from Norwex, and have it delivered straight to your door! Did you know that the chemicals in cleaning products can actually do more harm than good? 1 in 68 children has been identified with autism spectrum disorder. A recent study found an association between exposure to certain pesticides and a higher risk of Parkinson’s disease. National Cancer Institute found residues of 34 toxic chemicals in household carpet dust, including pesticides, herbicides, fungicides and PCBs. Environmental Working Group detected 287 chemicals in the cord blood of newborns. Of these, 180 cause cancer in humans or animals, 217 are toxic to the brain and nervous system, and 208 cause birth defects or abnormal development in animal tests. Homemakers have a higher incidence of cancer and it’s believed this is because not only do they use chemicals when cleaning, but then they stay in the environment absorbing more of the chemicals. I hope I've been able to answer any questions you have about Norwex. If you have any other questions that weren't covered here, feel free to comment below, or email me at aprilandmelissateamgreen@gmail.com. Would you like to view the Norwex catalog? Download your virtual copy HERE. Ready to order? Visit my Norwex Website.